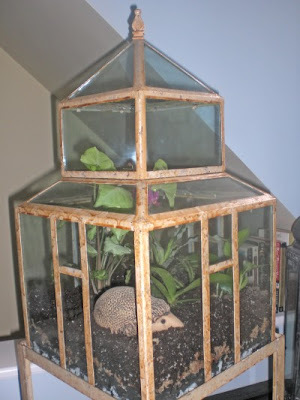 Alissa at mewpaperarts.com recently put together a gorgeous wardian case-type terrarium. I love the size and the top little cupola. Very cute! We added four plants–an indestructible philodendron, a miniature orchid, an arrowroot plant and an unidentifiable cactus-y/aloe-y looking thing.